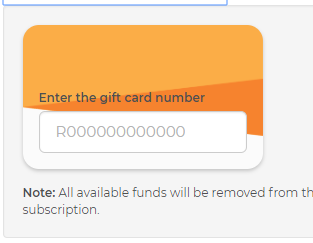 Applying a Gift Card to Platinum Membership. 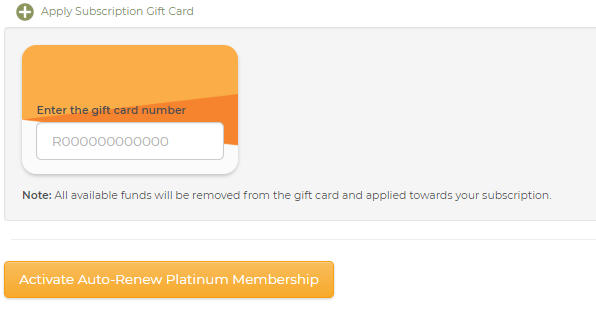 How to apply a gift card to use for your Platinum Membership (subscription). When signing up for the Platinum Rewards Membership using a gift card, you will login and go to the sign up page here. Due to the nature of subscriptions with auto-renewal, you will have to enter a credit card number to be associated with your subscription, even if you plan to cover all costs with an eGift card. When you are finished, click "Activate Auto-Renew Platinum Membership." Please be aware that by renewing online, your membership is set to auto-renew in a year. *IMPORTANT: Please be aware that all available funds will be removed from the gift card and applied to the subscription. For example, if you use a $99 gift card on Platinum, all $99 will be applied towards the Platinum membership for future billing, and the funds will not be available for other use. *IMPORTANT: Please be aware that all available funds will be removed from the gift card and applied to the subscription. For example, if you use a $99 gift card on Platinum, all $99 will be applied towards the Platinum membership for future billing and the funds will not be available for other use.